HB2320 - Would add a warning to the ballot that the legislature cannot change any ballot measures approved by voters. It would also cost taxpayers money, because they would have to pay for longer ballots and election materials. 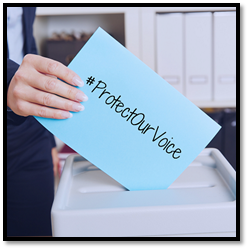 HB2404 - This places on unnecessary burden on our constitutional right to direct democracy and silences voters by increasing the difficulty and expense of placing an initiative on the ballot, making it impossible for citizens to have their voices heard. HCR2002 - A referendum that would repeal Prop 105, the Voter Protection Act. This repeal would allow legislators to change or even repeal ballot measures after voters have approved them. HCR2007 - A referendum that would exempt referendums from Prop 105, so any bill referred to the ballot for a vote by the legislature, and then approved by voters, could be changed at will by the legislature. HCR2029 - would make some voter's voices more powerful than others, depending on what district they live in. Every vote should count equally. Click here to determine your Legislative district, and find your Representatives’ names and contact information here. Be sure to mention that you are a resident in their district and let them know how important citizen initiative rights are to you.